On April 3, Ambassador Liu Xiaoming presented high-level foreign talents visas (R-visas) to the Rt Hon. Lord Sushanta Kumar Bhattacharyya FRS, Chairman and Founder of the Warwick Manufacturing Group and Professor Dale Sanders FRS, Director of the John Innes Centre at a ceremony at the Chinese Embassy. Ambassador Liu said that this year marks the 40th anniversary of China’s reform and opening-up, when the country is laying out new plans for further opening-up on all fronts. As President Xi Jinping said, “Development is the top priority, talents are the primary resources, and innovation is the primary driving force”, China is opening up its market to more overseas talents. The latest such effort is the R-visas, which will facilitate the country’s cooperation with others on scientific and technological innovation, demonstrate its sincerity and hospitality towards overseas talents, and meet its practical need for leapfrog development of scientific and technological innovation and higher level of opening-up. Last year, China and the UK signed The China-UK Joint Strategy for Science, Technology and Innovation Cooperation, drawing a new blueprint and offering greater potential, broader space and better prospects for China-UK cooperation in relevant fields. Ambassador Liu expressed appreciation to the two scientists for their outstanding contribution over the years to China-UK scientific and technological cooperation. He encouraged them to continue working with their Chinese partners to achieve more results and serve the peoples of the two countries. 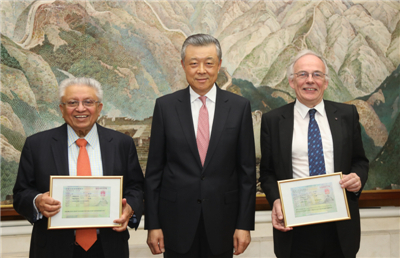 Lord Bhattacharyya and Professor Sanders thanked Ambassador Liu for representing the Chinese government to present the R-visas to them, as the first British scientists to be granted such honour. They spoke highly of the booming scientific and technological innovation in China, while happily recalled their cooperation with Chinese scientists in recent years. The R-visas would facilitate such cooperation, they said and expressed their expectation that with the joint efforts of the two sides, the China-UK cooperation in science and technology would bear more win-win fruits. After the ceremony, Lord Bhattacharyya and Professor Sanders gave interviews to China Central Television, Xinhua News Agency and China Daily. 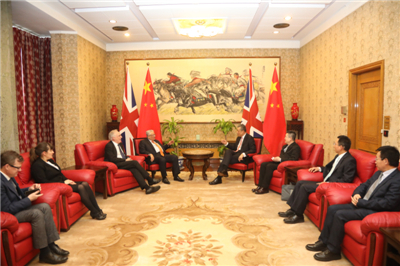 They said that they would work actively for new progress in China-UK scientific and technological cooperation, and inspire more British and Chinese researchers, particularly young talents, to participate in the mutually beneficial cooperation between the two countries. R-visas are issued by the Chinese government to foreigners who are high-level experts or whose skills are urgently needed in China. On November 2017, the State Administration of Foreign Experts Affairs (SAFEA), the Ministry of Foreign Affairs and the Ministry of Public Security jointly announced The Measures for the Implementation of the Visa System for Foreign Talents. It was the first time that the Chinese Embassy in the UK presented R-visas to British experts. Lord Bhattacharyya is a renowned scientist in material science and a fellow of the Royal Society. In 2017, he was issued the Certificate of Friendship by the Chinese government. Professor Sanders is a renowned botanist and also a fellow of the Royal Society. He leads the John Innes Centre which enjoys long-term partnership with Chinese Academy of Science.